I’ve been spending a lot of time with Count Dracula lately, so I figured it’s high time to change things up a bit. So, with that mind, lovers of weird cinema rejoice, haters of rock ‘n’ roll be damned! 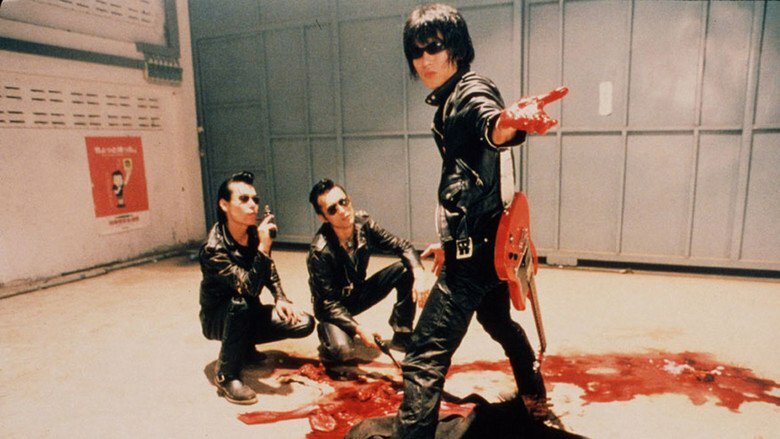 Japanese punkabilly heroes Guitar Wolf are here to make heads explode – zombie heads to be exact! Yes, friends, this is a movie like no other. Welcome to the insane world of Wild Zero! The thin plot is this: a greaser by the name of Ace has dreams of being a rock star. He goes to see a Guitar Wolf concert. Aliens invade. Wash. Repeat. That’s really about all there is to it. Well, it’s also a LOVE STORY naturally! Of course, all of this is peppered with awesome stuff like insane, gun-wielding rock managers, guitar-pick throwing stars, naked women with guns, and of course ROCK ‘N’ ROLL! This is a movie with more balls than sense. More style than plot. Imagine if someone fused the old Adam West Batman show with a George Romero movie, force fed it some acid, and only allowed it to listen to Link Wray. That’s this movie in a nutshell. If that’s not your idea of a good time, then get out of the way! Wild Zero doesn’t pretend to be a good film, it’s just a big nasty, dog that’s been let off its chain to pee all over your front yard. Trying to tie it down to the rules of traditional film making wouldn’t even be fair. It has its own agenda, which is basically to be the cinematic version of a mosh pit. And, like any good pit, you might get bruised up from the experience, but you’ll end up having a good time. Rent this camp classic tonight and see what I mean! 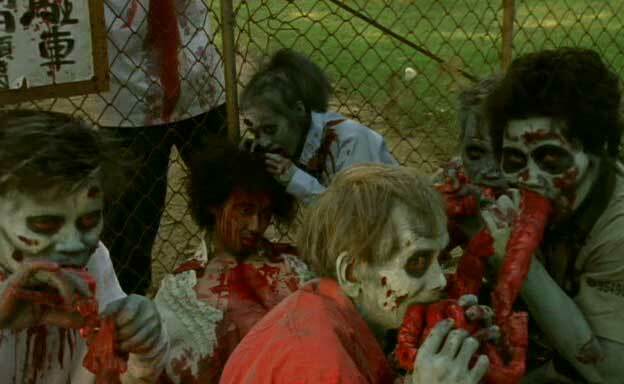 Retro Trailer: Return of the Living Dead!